Planet Earth is almost unimaginably old and throughout its existence has been in a state of constant change. One of the most significant events in the planet’s long history was the emergence of life and this in turn led to the formation of complex eco-systems with each species being dependant on many others. Evolution followed Darwinian principles with the emergence of new species and the extinction of others dependant on environmental factors. Millions of years of interaction have resulted in conditions suitable to support all of today’s living organisms, including ourselves but the planet is still in a state of constant change and there can be no doubt that the flora and fauna a few million years hence will be very different to that found today. Such long term changes are rarely considered by human beings as, in the context of a geological timescale, a human lifespan is the mere blinking of an eye. Having established that the living world can and will continue to change, it is important to look at the situation today in order to assess whether any major changes are currently occurring and question the reasons and consider the possible remedies. It is an uncomfortable truth that our species has and is still having an inordinately large effect on the acceleration of many damaging changes and, as an example, species extinction has been greatly increased due to human intervention and is estimated to be between 1000 and 10,000 times the normal rate. The major reason for this is the loss of habitats due to human activity. Deforestation is perhaps the most obvious case of man’s exploitation of the planet with tropical rainforests disappearing at an alarming rate. Such major changes not only destroy important habitats but can also lead to soil erosion, flooding and changes in weather patterns. The importance of trees simply cannot be overstated as they are often regarded as being the lungs of the planet taking in and locking away carbon dioxide and replenishing the atmosphere’s oxygen content. Some may doubt the permanence of this type of carbon sequestration arguing that trees only hold their carbon for a relatively limited time and it is later re-released to the atmosphere. Whilst this is true in cases where wood is used as fuel, it is not the case in a truly natural scenario where a tree at the end of its life will fall and much of its carbon content will subsequently be taken up by insects and micro-organisms. In ecologically managed woodlands, the problem of carbon re-release is addressed by a programme of replanting to ensure that the tree numbers increase rather than decrease. Agricultural practices also greatly affect local ecosystems with loss of habitat, reduction in plant varieties and use of pesticides having an adverse effect on many species including pollinating insects. The farming community have now come to recognise these problems with many farms now practicing ecological conservation and restoration. It is possible to plant a range of environmental grass seed and wildflower seed mixtures for habitat creation projects which will restore biodiversity in an area. It is still difficult for many people to come to terms with what is really meant by Ecological Restoration as, in the past, schemes to turn marshland into productive arable land have been hailed as progress and many people have welcomed the transformation of rough pasture land into a golf course. The effects of industrialisation have polluted our planet in many ways but the various remedies for many of these problems do not fall within the ecological restoration remit which simply makes use of plants and other natural terrestrial features in order to restore the chosen area to a condition conducive to biodiversity having no deleterious effects on water and air quality. Before beginning any ecological restoration project, clear objectives need to be set and it is useful to refer to a reference site which may be a real, historical or simply devised. All works are then planned to bring the site as near as possible to this reference. In many cases it will prove impossible to fully match the reference but progress towards this ideal is regarded as a success. Careful planning is required in order to maximise the potential benefits of the site and physical links with other similar ecosystems will help to encourage biodiversity. It is important to treat the causes of the site degradation rather than just dealing with the symptoms in order to ensure that the earlier problems do not persist and a conservative approach of repairing what remains is preferable to widespread complete replacement. The aim is to produce a site which is self sustaining and able to withstand any future natural stresses. Selection of indigenous plant species is the best practice and some care may be needed in the early stages to prevent the establishment of invasive species. Once the site is properly established, it should require very little future intervention. 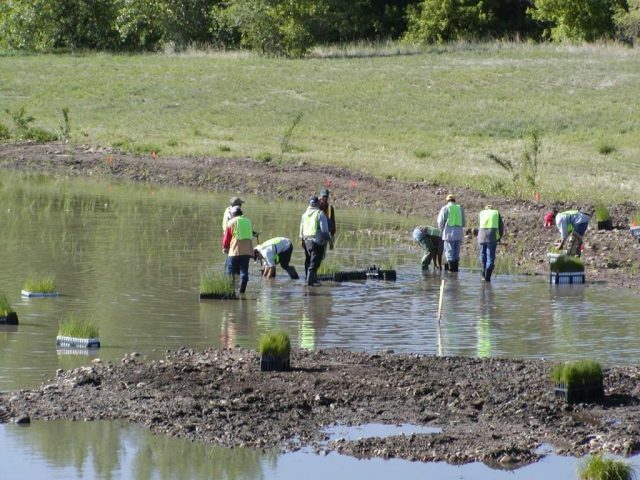 Most people readily accept that ecological restoration is a good thing but human nature dictates that most people will only carry out such a scheme if they believe that they will receive some direct benefit from it. Although benefits to humans should not really have any bearing on the facts, it is often reassuring to be involved in a long term scheme which will help future generations. Of course some people still have the attitude: “Future generations? What have they ever done for me?” and these doubters will welcome the fact that ecological restoration schemes usually form part of a wider plan to produce economic viability by employing eco-friendly techniques to ensure that the site becomes completely sustainable. Organisations such as the FSC can provide a great deal of advice regarding woodland management and operate a certification scheme for ethically produced timber. Ecological restoration therefore should be considered to be a goal which may not be completely achieved but should always represent a step in the right direction. The term “restoration” obviously implies putting things back to how they used to be but the practicalities of this will probably dictate just how far back the reference point will be. Although it would be wonderful to return the world to some kind of Utopian Garden of Eden this is not going to happen and, even going back just a couple of thousand years, the UK’s moorlands would have been thickly forested with roaming wolves and bears until deforestation took place, sheep were introduced and the Romans introduced a garden plant called Heather. So changes continue to happen and we have to live with the consequences. Ecological restoration is not a quick fix and many tree species live for hundreds of years so, even though we may not fully benefit from our efforts, we must act now to counteract and reverse the damage that has already been done. It is easy to dismiss such works as having no great impact but the secret is to think globally and act locally. Ecological restoration really is much more than just a bunch of eco-warriors doing a spot of gardening! Next articleWhat is the Greenhouse Effect? For anyone wanting more information, SER ( Society for Ecological Restoration ) is a good place to start. It is a global community of restoration professionals that provide expertise, training and some helpful publications; http://www.ser.org/page/Publications. I like that you talked about the practices that help ecosystems grow without harming habitats or plant varieties, like with bush regeneration. My sister owns a lot of land that used to be live on, and now she wants to help restore it to its natural state. I think bush regeneration could help return the vegetation and soil to a healthy place without harming what has already grown. Restoration projects are a fantastic idea. Land will revert on it’s own if you leave for long enough, however, there are things you can do to greatly speed up the process and also maximise it’s usefulness for insects, birds and other wildlife. If you want to kick-start your ecosystem then find a reputable supplier of seeds (seeds are much cheaper than buying plants). Do some research so you know the seeds you choose are naturally occurring in the area and suit the microclimate of your patch of earth. Search for phrases like ‘Stewardship Mixtures’ or ‘Habitat Recovery’ to find a suitable seed supplier. If you can – select a seed mix of grasses, flowers and shrubs. This will provide both food and cover for insects and animals over a long period of time. Cover crops are very important because they provide habitat for insects and birds – somewhere to hide, nest, lay eggs etc. Include some perennials too.